Caregiving is a tough job. This November, we remember the people who lovingly give baths, clean houses, shop for, and comfort the millions of elderly and ill people who are friends and loved ones. November is National Family Caregivers Month and this year’s theme is “Caregiving Around the Clock.” Check out the latest helpful hints and community resources because if you don’t take care of yourself, you can’t take care of anyone else. ​A major milestone was reached with the golden anniversary of both Medicare and Medicaid, highlighting 50 years of financial and medical support to the elderly. ​China has always honored its elderly but a new Chinese law mandated that adult children were obligated to visit their parents. ​ 40 million American Baby Boomers turned 65. ​Social Security became a cornerstone of FDR’s New Deal. 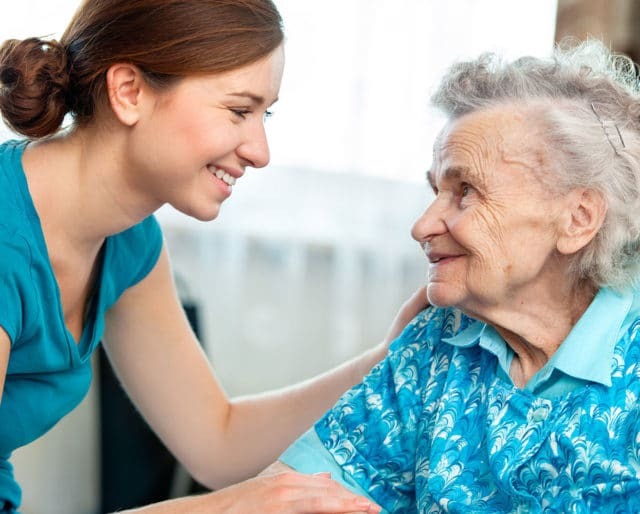 ​An innovative idea created the Visiting Nurse Society as a way to help the elderly poor with charitable in-home care. Since it's National Family Caregivers Month, do something to make an impact. Check with the National Alliance for Caregiving for the details but if you can't get away to Washington, attend a workshop instead. They have lots of practical advice. The main thing is to know that you are not alone. Download the Circle of Care Mental Health Toolkit. Sponsored by the National Alliance for Caregiving, the toolkit covers topics including taking care of yourself, getting an accurate diagnosis, communicating with health professionals, finding community services, finding providers and more. This month, the resources you need are just a click away. One of the healthiest things you can do for yourself is to fit naps into your weekly schedule. Round-the- clock caregiving is never easy. But when your loved one takes a break, don't do another task — you take a break too. It's important not to wear yourself down or who will take care of you? ​Over half of family caregivers are women. ​One of out of every four caregivers reports diminished family relationships because of caregiving a loved one. Most caregivers work outside the home either part- or full-time in addition to their caregiving responsibilities. ​Over a million American young people, aged eight to 18, care for an adult relative on a daily basis. Nearly 70 percent of caregivers report they don’t see their doctor regularly because of their responsibilities. Caregiving while still holding down an outside job is exhausting. Much of caregiving is unpaid. National Family Caregivers Month in November provides resources for self-care, advocacy, and de-stressing for our caregivers. The month is dedicated to supporting caregivers as they care for others. This year’s theme is “Caregiving Around the Clock." National Family Caregivers Month features lots of vital information to help caregivers cope with a tough, and sometimes thankless job. There are tips for caregivers such as taking care of your own health, accepting offers of help from others, learning the skills to speak effectively with doctors, and being open to new, assistive technologies that can lighten your load. If you don’t take care of yourself, who will? Watching a parent age or seeing someone change drastically due to illness can be devastating. Take some time to monitor your own wellbeing. If you are not sleeping well, exercising, or feel yourself becoming reclusive, speak to a professional about depression. It can hit anyone at any time. There's no shame in feeling overwhelmed.